Monsignor Bonaventure Finnbarr Francis Broderick was the Coadjutor Bishop of the then Diocese of San Cristóbal de la Habana, and ran a gas station for 40 years until Cardinal Francis Spellman restored him as an Auxiliary Bishop to the Archdiocese of New York. While restored to the Curia, Broderick died before he became a Diocesan Ordinary. Bonaventure Broderick was born in Hartford, Connecticut, to John Harris Broderick and Margaret Healy. Broderick accomplished his undergraduate seminary studies at St. Charles College in Ellicott City, Maryland. The Archbishop of the Archdiocese of Hartford sent him to the Pontifical Roman Athenaeum S. Apollinare of Propaganda Fide at the North American College as a resident student. In 1897, Broderick earned his PhD., followed by a Doctorate of Theology, from the same College. Ordained to the Priesthood at 27 years of age for the Archdiocese of Hartford by then Bishop Francesco di Paola Cassetta, who was the Patriarch of Jerusalem and Vicegerent of Rome, while in the Eternal City, Broderick returned to the Diocese and was assigned as a Pastor in West Hartford and Ford, Connecticut. From 1898 to 1900, he was a Faculty Member at St. Thomas Seminary at Hartford, Connecticut. When his former Italian instructor, then Bishop Donato Sbarretti was appointed as the Ordinary of the Archdiocese of San Cristóbal de la Habana, he appointed Broderick as his Secretary. On June 25, 1900, Broderick became the Administrator for St. Francis de Sales Church in Cuba. He would later become the Administrator of San Carlos and San Ambrosio Seminary. On May 20, 1902, Broderick represented the Catholic Church recognizing the establishment of the Republic of Cuba. While in Cuba, Broderick had to settle claims against the United States Government because of damage done to church property during the Spanish-American War. There were rumors his brother was involved with a government contract to install a sewer system in Havana. Bonaventure Broderick sued his brother, David A. Broderick, in a Hartford, Connecticut superior court over some Cuba contracts and won a judgment. It was unclear why his superiors were angry with Broderick. On September 7, 1903, at the early age of 34, Broderick was appointed Auxiliary Bishop of the Diocese of San Cristóbal de la Habana by Pope Pius X, receiving his Episcopal Consecration with the Titular See of Iuliopolis, on the following October 28, from Archbishop Placide Louis Chapelle, assisted by Archbishop Francisco de Paula Barnada y Aguila and Rev. Manuel Espinosa. Broderick was appointed Coadjutor of the same See on the following November 9. Two years later, at 36 years of age, on March 1, 1905, Bishop Broderick resigned from Office due to a misunderstanding with Pope Pius X and the Vatican over the collection of some funds. While doing some archdiocesan business in Millbrook, New York, the then Archbishop of the Archdiocese of New York, Francis Spellman, found Broderick running a gas station in Millbrook where he wrote a weekly column for a local newspaper. In November 1939, the Vatican asked Spellman to rehabilitate Broderick and Spellman complied. Broderick resumed his public vows as a Bishop and was made a Chaplain of a hospital in Riverdale, New York. Monsignor Broderick passed away on Thursday, November 18, 1943, in the morning, aged 74, at the Frances Schervier Hospital of Riverdale, New York. Two days later, Archbishop Spellman celebrated his Funeral Mass at St. Patrick's Metropolitan Cathedral at 10 am. Among those present were Msgrs. James Francis McIntyre - who delivered the Eulogy -, Thomas Edmund Molloy, John Francis O'Hara, and Henry J. O'Brien. In his will he left Archbishop Spellman his pectoral cross, its chains, his episcopal ring and crosier. The rest of his property was bequeathed to the Sisters of the Poor of San Francisco, according to his own wishes. For many years it remained unknown why the Bishop Broderick left Cuba and resigned from his post. In 1962, Fr. Robert I. Gannon SJ., published "The Cardinal Spellman Story", and in the latter, in pages 156 - 161, one can find a detailed report to the Apostolic Delegate in the United States, Archbishop Amleto Giovanni Cicognani, Titular Archbishop of the See of Laodicea di Phrygia, dated November 12, 1939. 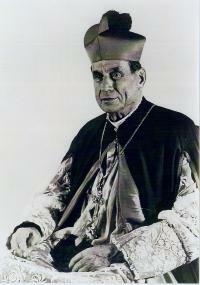 According to the report, the Apostolic Delegate in Cuba, Archbishop Chapelle, fell out with Bishop Broderick and went to Rome to present his grievances. The Bishop decided to also go to Rome to explain his position. Both met the reasons presented to Pope Pius X and Cardinal Rafael Merry del Val, Secretary of State, as document No. 9184 with the Secretary of State. When he reached the United States, the Bishop received a telegram from Cardinal James Gibbons, Archbishop of Baltimore, asking him to go see him immediately. The Cardinal was abrupt and informed him that his mission had been revoked. This left Bishop Broderick with no mission or economic backgrounds. The Bishop wrote to the Pope, informing him about his situation. Pius X replied on March 29, 1905, with a letter written by his own hand. In the letter, the Pope explained that he had to revoke his order because of the protest of many American Bishops who felt that it made them look incompetent. Bishop Broderick wrote to the Pope saying that the fact that a Bishop had no job and no place to go could cause scandal in the United States. The Pope interpreted this statement as a threat to cause scandal and he responded that this had caused him grief. The Holy See assigned a pension of $ 100 per month with no charge of any mission. To sustain himself, Bishop Broderick worked for about 34 years in an establishment of auto accessories and sale of gasoline in Millbrook, a town which is about 80 miles from New York. Plot: Section 43, Block B 4, Plot 60, Grave 3. [S633] John H. Broderick household, 1870 United States Federal Census, Hartford, Connecticut, population schedule, Waterbury, ED 2nd Ward, sheet 138, dwelling 1124, family 1107. [S129] John Broadwick household, 1880 United States Federal Census, New Haven, Connecticut, population schedule, Waterbury, ED 42, page 48, dwelling 313, family 467, shows Bonaventure Broadwick in error. [S634] Margaret Broderick household, 1910 United States Federal Census, Westchester, New York, population schedule, Yonkers, ED 173, sheet 15A, dwelling 15, family 160. [S631] W. F. Brainard, Who's Who in New York. [S635] Bonaventure Broderick household, 1920 United States Federal Census, Ulster, New York, population schedule, Saugerties, ED 201, sheet 7A, dwelling 150, family 161. [S636] Helen Bowlen household, 1930 United States Federal Census, Dutchess, New York, population schedule, Pleasant Valley, ED 39, sheet 1B, dwelling 19, family 20. [S129] John Broadwick household, 1880 United States Federal Census, New Haven, Connecticut, population schedule, Waterbury, ED 42, page 48, dwelling 313, family 467, shows Bonaventure as John's son. [S129] John Broadwick household, 1880 United States Federal Census, New Haven, Connecticut, population schedule, Waterbury, ED 42, page 48, dwelling 313, family 467. [S634] Margaret Broderick household, 1910 United States Federal Census, Westchester, New York, population schedule, Yonkers, ED 173, sheet 15A, dwelling 15, family 160, shows mother as Margaret Broderick. [S940] The NY Times, 6 July 1917, stated that she was the beloved mother of the Right Rev. Bishop Broderick. [S633] John H. Broderick household, 1870 United States Federal Census, Hartford, Connecticut, population schedule, Waterbury, ED 2nd Ward, sheet 138, dwelling 1124, family 1107, shows age 1 and birthplace as Conn.
[S129] John Broadwick household, 1880 United States Federal Census, New Haven, Connecticut, population schedule, Waterbury, ED 42, page 48, dwelling 313, family 467, shows age 11 and birthplace as Connecticut. [S634] Margaret Broderick household, 1910 United States Federal Census, Westchester, New York, population schedule, Yonkers, ED 173, sheet 15A, dwelling 15, family 160, shows age 41 and birthplace as Connecticut. [S635] Bonaventure Broderick household, 1920 United States Federal Census, Ulster, New York, population schedule, Saugerties, ED 201, sheet 7A, dwelling 150, family 161, shows age 51. [S636] Helen Bowlen household, 1930 United States Federal Census, Dutchess, New York, population schedule, Pleasant Valley, ED 39, sheet 1B, dwelling 19, family 20, shows age 61. [S632] Dates and Death of Priests of the Archdiocese of New York, online http:// hometown.aol.com/mtmc525/myhomepage/index.html, shows his name followed by rank of "BISHOP." [S129] John Broadwick household, 1880 United States Federal Census, New Haven, Connecticut, population schedule, Waterbury, ED 42, page 48, dwelling 313, family 467, shows his residence. [S940] The NY Times, 6 July 1917. [S955] Margaret Broderick's Death Certificate, The Public Register of Deaths. [S1293] Most Reverend Bonaventure Broderick household, 1940 United States Federal Census, Queens County, New York, population schedule, New York, ED 3-1242, sheet 5B. [S632] Dates and Death of Priests of the Archdiocese of New York, online http:// hometown.aol.com/mtmc525/myhomepage/index.html. [S1280] Find-A-Grave, online www.findagrave.com, Bishop Bonaventure Finbarr Francis Broderick.